The Rev. Kenneth S. Robinson, M.D., former Tennessee Commissioner of Health, pastor and chief executive of St. Andrew AME Church in Memphis, and current Shelby County Public Health Policy Advisor, will deliver the annual Martin Luther King Jr. Day lecture at Vanderbilt University Medical Center. The Rev. 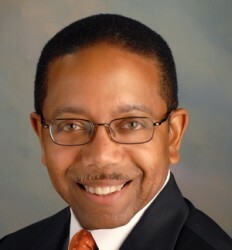 Kenneth S. Robinson, M.D. Robinson, who received a Master of Divinity from Vanderbilt Divinity School in 1986 and is a former faculty member, is a life-long champion of holistic and comprehensive approaches to public health. The title of Robinson’s talk is “MLK Day: A View from the 21st Century Pulpit.” The lecture is scheduled for Monday, Jan. 21, in 208 Light Hall from noon to 1 p.m. The lecture is free and open to the public. Following the lecture, Vanderbilt students will participate in a day of community service with select Metro Nashville agencies. For more information on the lecture, contact Jana Lauderdale, Ph.D., R.N., assistant dean, Office of Diversity and Inclusion at Vanderbilt University School of Nursing, at 343-2228, or André Churchwell, M.D., associate dean for Diversity at Vanderbilt University School of Medicine at 322-7498.